Bill to Ban Aquarium Fishing Heard by Senate Committee. Senate Bill 931 would prohibit the collection of aquarium or ornamental reef fish because their capture is incompatible with Kanaka Maoli values. Hawaii Public Radio. 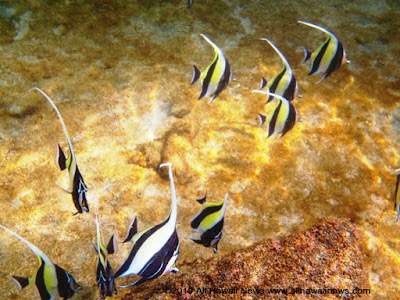 A Senate panel Friday deferred a decision on whether to advance a controversial bill that would shut down the commercial collection of aquarium fish in Hawaii. Star-Advertiser. State lawmakers are considering allowing Alexander &Baldwin Inc., the state’s electrical utilities on Kauai and Hawaii island and a number of farming and ranching operations to continue using public water for another seven years even if they haven’t completed environmental reviews, consultations with Native Hawaiians about water needs, appraisals and, in some cases, public auctions — requirements envisioned by Hawaii’s laws protecting the state’s water resources. Star-Advertiser. Attorney says another state hospital patient has confessed to giving Randall Saito fake ID's. Attorney Michael Green says the patient provided Saito with the fake ID's that allowed him to fly all the way to California. KHON2. The number of bankruptcy filings in Hawaii increased by more than 40 percent to 149 cases last month, marking the highest level for January in seven years, according to U.S. Bankruptcy Court records. Associated Press. Bank of Hawaii has been ranked fourth among U.S. financial institutions and 40th overall in the 2019 “100 Most Sustainable Companies list,” published Friday by Barron’s magazine. Star-Advertiser. Women say city prosecutor retaliated against them for testifying in corruption probe. Two women who testified against their boss — city Prosecutor Keith Kaneshiro — as part of an ongoing federal probe claim they’re now being retaliated against and face disciplinary action. Hawaii News Now. Former Pearl Harbor Navy Spokesman Sentenced In Corruption Scandal. The former director of public affairs took money for authoring emails to top Navy officials on behalf of a contractor convicted of bribery and fraud. Civil Beat. Motorists in need of street parking in downtown Honolulu on Monday generally aren’t happy about the city’s announcement that on-street parking meter rates will be doubling in the coming weeks. Star-Advertiser. Businesses unhappy with doubled parking meter rates. KHON2. The price of most metered parking doubled on Oahu Monday. The increase was approved back in 2017. KITV. A planned wind farm is getting opposition from an unusual source: Environmentalists. The developers of the Palehua Wind project say it’s one of the last and best sites to build a wind farm on Oahu. Hawaii News Now. Cleanup gets underway after powerful gusts and high surf. The crumbling Royal Hawaiian groin, between the Waikiki Sheraton and Royal Hawaiian hotels, was still standing Monday despite facing threats from a weekend storm. Star-Advertiser. Weeks of work may be ahead for windstorm cleanup. The weekend windstorm resulted in 90 tree-related calls and nearly 80 blown roofs reported. Hawaii News Now. The North Shore was hit hard by the storm on Sunday. KHON2. These Rare Seabirds Are Having Babies On Oahu’s North Shore. Years of chopping down invasive trees, replanting native species and controlling predators may be paying off for albatross threatened by sea level rise. Civil Beat. Noa Botanicals is preparing to open its second medical cannabis dispensary on Oahu this week. The company is expanding into a 1,700-square-foot retail center across from Windward Mall behind Zippy’s in Kaneohe at the Windward Centre. Star-Advertiser. Armed with search warrants, the city Prosecutor’s Office and Honolulu police raided two massage parlors Monday morning. They were raided on suspicion of promoting prostitution. Hawaii News Now. Council terms could be extended from two to four years under a ballot measure advanced by the Charter Commission last week, but under another measure, council members could be docked a month’s pay if they don’t show up. West Hawaii Today. Commissioners last week delayed making any recommendations on a developer request to alter the conditions for the planned Wailani Development in Hilo. Big Island Video News. Loss Of Slaughterhouse Cripples Specialty Meat Industry. The island’s only full-service slaughterhouse has quit taking smaller animals, leaving farmers, butchers and lovers of fresh kalua pork with no place to turn. Civil Beat. Power disruption affects 45,000. The loss of the Spectrum Communications line resulted in Monday’s closure of the Vehicle Registration and Driver’s license Services in Waimea and the West Hawaii Civic Center in Kailua-Kona. West Hawaii Today. Snow closes Haleakala National Park. At least six inches to a foot of snow fell at Haleakala summit Saturday night into Sunday, according to National Weather Service meteorologist Matt Foster. Star-Advertiser. Additional Snow Accumulation at Haleakala; Closed Until Further Notice. Maui Now. Haleakala National Park closed due to extreme weather conditions. KITV. Power restored to most customers; Haleakala still closed. Maui News. Auwahi Wind Farm Draft Habitat Hearing, Feb. 15. An opening hearing will be held to receive testimony on the Auwahi Wind Farm draft Habitat Conservation Plan amendment. Maui Now. The aftermath. Jill Lowry just came on board as executive director of Anaina Hou Community Park — in time for the weekend storm that hit the North Shore hard. Garden Island. Tickets are selling fast for the 15th annual Mayor’s Prayer Luncheon on March 9 at Kilohana Luau Pavilion. Garden Island. Future teachers get financial aid. Growing Our Own Teachers on Kauai relies on donations and fundraising events to provide these financial awards. Garden Island.